(April 2011)  April 12, 2011, will mark the 150th anniversary of the beginning of the Civil War. The day that Confederate cannons fired on Fort Sumter, S.C., in 1861 will be remembered and relived through the efforts of many Civil War history buffs in Madison, Ind. of the start of the Civil War. Disunion! The War Begins! will be presented at the Lanier Mansion State Historic Site at 8 p.m. Tuesday, April 12. The festivities will begin promptly with the lighting of 150 luminaries around the grounds of the mansion. 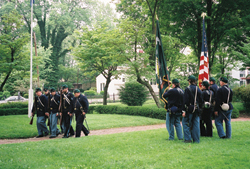 An ensuing 30-minute program will consist of a ceremony held at the Civil War Memorial on the Visitor Center Plaza, period music and readings from letters, diaries and the Madison Daily Courier describing the start of the war in 1861. Confederate re-enactors from the Nelson Artillery will provide a bagpiper, bugler and fire a cannon to mark the assault on Fort Sumter, near Charleston. The state of Indiana played its part in the Civil War through local businessman and former resident, J.F.D. Lanier. By the time the war began, Lanier was living in New York City but still held strong ties to Madison. Lanier was very helpful to the war effort, said Reilly. He bought $400,000 in bonds to equip the troops with clothing, food and barracks. By the close of the war, Lanier had made a total of unsecured loans totaling more than $1 million. In the middle of the Civil War, there was a political situation in Indiana, said Reilly. Indiana Gov. Oliver P. Morton suppressed the Democratic Party, which controlled the General Assembly and largely sympathized with the Confederacy. In 1862, he never called the General Assembly into session, which meant no budget or tax provisions were passed. When the state was left without the authority to collect taxes, Indiana neared bankruptcy. Gov. Morton used private funds supplied by Lanier to finance the war effort, rather than rely on the Legislature for funding. During the Civil War, the state of Indiana did not secede from the Union. It was the first state in what was considered the American Northwest at the time to mobilize for the war. The day after the attack on Fort Sumter, two mass meetings were held in the state, and the citizens of Indiana decided to remain in the Union. President Abraham Lincoln asked the state to send 7,500 men to join the Union forces. Five hundred men volunteered the first day. Three weeks later, more than 22,000 men had volunteered. Since this well exceeded Lincolns request, many had to be turned away. By the end of the war, the state had contributed approximately 210,000 soldiers and much in financial aid for equipment and supplies for Union soldiers. Indiana was ranked as having the fifth-highest population in the Union and the sixth highest of all the states, making it critical to Northern success. Indiana was also important for its agricultural yield. This was an invaluable commodity to Union troops after the loss of farmland in the South. In the course of the war, there were two minor Confederate raids and one major raid in 1863. This latter raid caused a brief panic in the southern parts of the state and the capital, Indianapolis. John Hunt Morgans raid of the state in July 1863 has been significantly marked throughout the state as a reminder of the Civil War. The Civil War really formed the country we are now, Reilly said. In addition to slaves being owned before the war, the states had a lot more power than they do today; it formed our modern military structure and the presidents power increased a lot, he said. The Roundtable, of which Reilly is also a member, meets the second Tuesday of every month with Aprils meeting date coinciding with the 150th anniversary date and the events planned at the Lanier Mansion. The Roundtable decided to hold their monthly meeting at the Lanier Mansion and include a guest speaker who would present a program about a Civil War topic. Author Gail Stephens will present a talk about her latest book, The Shadow of Shiloh, Maj. Gen. Lew Wallace in the Civil War at 6:30 p.m. at the Lanier-Madison Visitors Center, 601 W. First St. This talk is free and open to the public. Wallace was appointed state adjutant general at the beginning of the Civil War and became Indianas first Major General during the Civil War. He rallied the people of Indiana to fight for the Union, said Stephens. Out of a total population of 32 million people, more than 600,000 Americans died. By the end of the war, 46 general officers in the Union army had resided in Indiana at some point in their lives. Anyone wishing to attend Disunion! The War Begins! is not required to attend Stephens talk. Although this is her first book dealing with the Civil War, Stephens has written articles and an essay on Wallace for a collection of essays to be published in a book by the Battlefield Preservation Association. With the exception of Aprils meeting, the Jefferson County Civil War Roundtable meets at 7 p.m. on the second Tuesday of every month during the school year at the Brown Room of the Madison Presbyterian Church. Meetings are open to the public.  For more information on Disunion! The War Begins! contact Gerry Reilly at (812) 273-0556. This event is sponsored by the Morgan & Nay Funeral Centre and the Jefferson County Civil War Roundtable.